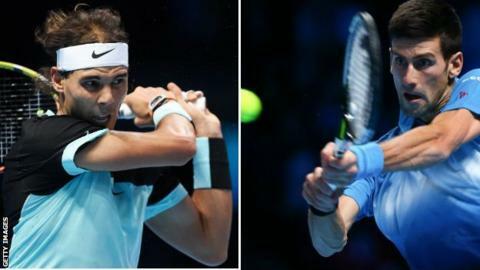 Novak Djokovic will face a rejuvenated Rafael Nadal in the ATP World Tour Finals last four in London on Saturday. The pair will meet for the 46th time, with Nadal leading 23-22, in the first semi-final at 14:00 GMT. "Against Novak, I know what I have to do," said fifth seed Nadal. "But it's going to be very difficult to make it happen. It's a big challenge." Roger Federer plays fellow Swiss Stan Wawrinka in the second semi-final at 20:00 GMT at the O2 Arena. Wawrinka knocked out Britain's Andy Murray by winning the final group match on Friday. Djokovic is two victories away from becoming the first man to win the season finale four times in a row. The Serb, 28, has won seven of his past eight meetings with Nadal, including all three this year. Although Nadal has failed to reach the semi-finals of a major in an injury-plagued season, he won all three of his group matches this week, against Wawrinka, Murray and David Ferrer. Djokovic said: "It's a fact that he's been playing better and he's been raising his level ever since the US Open. "The first couple of matches he played here against Wawrinka and Murray showed that he feels more confident, shows that he's starting to miss less, serve efficiently, use his forehand much better. I know that - I've been watching." Spaniard Nadal, 29, has been feeling positive about his tennis in London and said he plans a long, hard off-season of practice, jokingly adding: "I don't deserve a vacation this year." He still faces a major task to oust Djokovic in an arena the Serb has made his own in recent years. "I cannot go crazy," said Nadal. "I cannot go on the court thinking that I have to do something that I cannot do. "I know the surface is better for him than for me. "I'm going to try to play my game. I'm going to try to play aggressive. I'm going to try to be strong mentally."